Our Oil is filtered in the traditional way. The oil goes through a cellulose paper which absorbs humidity and keeps the organic particles. This process is without pressure to prevent heating or to emulsify the oil. We do not stock oil in the bottle prior to shipment. 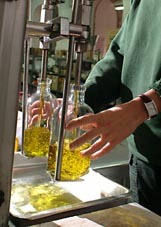 We filter and bottle the oil for each indiviual order from our customers to ensure the freshest product.